Sorry if this is the wrong area, but is there a valuation area? Having trouble with pricing ledy items. Location : Llandudno - North Wales. Focus : Ledy. Variants. Droids and ewoks TV series. This is a good place for a valuation thread. Morning guys. I have in my collection a 12" basa chewie. No accessories or anything but still a pretty rare and unusual piece. Has anyone ever seen one of these for sale and if so what price was it pitched at? I'll try to get a photo up later. Thanks! have stumbled across a loose Meccano rough scarred Ackbar today. any idea on value boys. a nieche loose variant i know. Hi Chris. I'll give my opinion on your Ackbar. I think about £35. [You must be registered and logged in to see this link.] wrote: Morning guys. I have in my collection a 12" basa chewie. No accessories or anything but still a pretty rare and unusual piece. Has anyone ever seen one of these for sale and if so what price was it pitched at? I'll try to get a photo up later. Thanks! Mark, did you contact Lee over on SWFUK? He would know what a loose Basa chewie would be worth. Like you said, it's fairly hard to find. [You must be registered and logged in to see this link.] wrote: have stumbled across a loose Meccano rough scarred Ackbar today. any idea on value boys. a nieche loose variant i know. Chris, hopefully some of the up to date collectors will be able to help you out. I haven't collected variants for a couple of years, so I'm well behind on the market values. I did contact Lee. He said although its extremely rare its not in demand enough to be worth a great deal. \Especially naked. Hey quick question, I'm looking at a Spanish Trilogo Anakin with a big yellow "new figure" sticker. Is that worth substantially more than a plain palitoy trilogo? 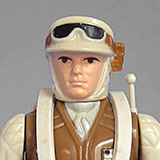 On SW tracker the plain palitoy is averaging $100 cad, I'm talking to a seller wanting $250 for a Spanish one and it's not in amazing shape. What makes it Spanish Chris? I've only seen Palitoy examples with the large yellow sticker with 'new figure' in red and a price of '£1.59' printed in blue (Many can be found with a black cross on the sticker with a cheaper retailer price sticker applied e.g. 99p or 49p). Most of mainland Europe got the unstickered cards. Some collectors find the unstickered cards more desirable. Have you got a picture? $250 is expensive for a rough example as Anakin is probably the most common last 17 trilogo moc out there. Never heard of any differences among tri-logo cards except for the sticker. $250 is way too much though. I am completely new to this forum as of about 5 mins ago. I am seeking help and advice regarding a 20 Back Han Solo (Yan Solo) Meccano MOC and UKGraded. I have had offers ranging from a couple of hundred to several thousand which has been unhelpful. I have tried searching Google for images and all I can find is mine and 1 other listed on an archive collection site and owned by the renowned Sebastian Faubert (forgive the spelling). Any help understanding its rarity and value would be great. I collect Kenner rather than the Meccano stuff so its not something I want to keep. What is the grade? Also if you could post a couple of pictures, that would help. Don't use the Photobucket option. The other 2 ways work just fine. It was graded at 40% overall because of the card back is not in great condition. I only got it graded to protect it really, I knew it wasnt going to be a fantastic number but the guys at UKG said they have never seen one still in the box which was cool. I just put the information into Star Wars Tracker, and nothing has been sold in any of the open markets, for the last 10 years. Hopefully someone that collects Meccano, will be able to help. The other thing, is to contact Stephen Faucourt or the FB groups. Ok great thanks very much for your help.